We spent this past Saturday drilling holes and pounding spiles. In just one day, we were able to install all 650 taps. This was a dramatic and welcome change from last season when it took many days to accomplish the same task. Last year Don and Peter were debating with each other whether it was easier to walk clumsily in snowshoes and have a difficult time stepping over and under the tubing lines or if it was better to be in boots and sink over two feet, but be able to not trip on the lines. Neither option was an easy option. This year, in contrast, we could have jogged through the woods with hardly a care. There is little snow covering the forest floor, so installing taps was a breeze. The lack of snow is concerning for us this season. There are so many variables that influence sap flow, that it seems difficult to isolate how one change will increase or decrease sap yield. But one trend that seems to stand out over time is that Winters that have heavy snowfall are followed by strong Spring sap flows. We have a couple of hypotheses about why this might happen: 1) the snow delays prolonged warm periods, increasing the number of days where temperatures fluctuate around the freezing point; and 2) the snow provides needed moisture to the tree. This year we entered winter in near drought conditions and followed that up with one of the warmest and driest winters on record. Our prediction is that this will be a weak season, but we hope that we are wrong. This is the earliest that we have ever installed our taps and seen sap flow. There was minor flow from about 10% of the trees on the south facing taps. There certainly isn't enough sap to boil yet. 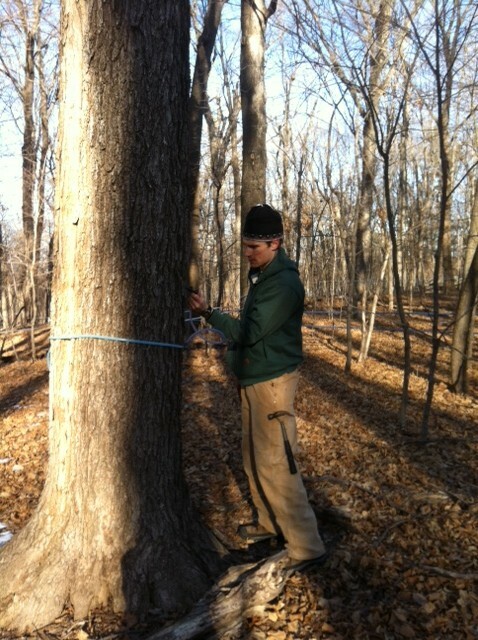 The upcoming weather looks promising for sap flow, but it seems like early flows are usually weaker in our sugarbush. However, we are certainly ready to start boiling. The beautiful weather on Saturday and Sunday, along with completed tapping, allowed us to clean all of the equipment in preparation for the work ahead. We are currently sold out of most sizes of maple syrup. We will be filling orders on a first come, first served basis once production resumes. Please feel free to send in your orders via email to dsomers@citlink.net .